Creating something beautiful from raw material warms a place inside of me and makes me smile. I hope you smile when you create, too. The beautiful die in the corner is a Spellbinders, made for Heartfelt Creations, entitled the Decorative Blossom Corner. My Favorite Things medium sized die was used for the rolled rose, and a leaf from Spellbinders Foliage adds a note of green. The bottom border was embossed with a small folder I've lost the info for, but I'm sure it was a Cuttlebug. A Stampin Up punch was used for the sentiment, but I cut it down so it wasn't such a large expanse of white. This hummingbird die from CheeryLynn was cut from a rosey, purple glitter paper, but it's hard to see here. The paper, from DCWV Chateau Lavender stack, features such beautiful, glittered flowers, that I couldn't bare to cover them up. I marked where my gold (yes, that is gold, not dark green - sheesh, I need more practice with Photoshop) circle would lay, then I cut around the flowers so I could lift them on top of the circle. Not a stroke of coloring on this project - quick and easy! The theme of this challenge was cute and fun. Kids and animals - how much more cuteness can a person stand? This image is a digi by artist Lynne Stansbery, which can be purchased through Squigglefly. The paper here is American Crafts for the base and die cuts, and Heartfelt Creations Floral Key for the pattern. The sentiment is found included in the paper stack. Thank you for coming with me on this LoveFest challenge. I'll probably take a day or two off to pick the paper scraps off the floor, clean the ink residue out of the sink, and get the glitter out of my eyes, but I'll be back. Hope you will be, too. I've had a couple of people tell me that they haven't been able to leave a comment on my blog. I had been receiving a fair amount of spam and wanted to block them from leaving comments, so I added some stronger controls. But I don't want to block friends who want to leave a message, and that seems to have been the unfortunate result. Today, I restored the settings back to something more open, and hope you can now make all the comments you wish, cause I love to hear from you. Scor-Pal is one of the company sponsors for the Splitcoast Stampers Love Fest Challenge. While shabby isn't one of my "go-to" looks (except for a night on the couch with the remote control) Scor-Pal is definitely one my favorite tools. For inspiration, I reached for Diana Crick and Penny Wessenauer's book entitled, Score, Fold, Create and pretty much CASEd a project found there. This card starts with a 5x7 gatefold card. I added patterned paper panels on the front and inside. Both card and paper are from the DCWV Linen Closet stack. I scored a piece of scrap white-core navy card with the regular scoring tool and with the scor-bug (to make the dotted lines) and sanded it carefully. Here's a tip, sand your solid lines first, before doing the dotted lines, as the dots raise higher than the regular scores and you'll have a hard time sanding the solid lines. Then I cut/embossed this piece with a Spellbinders Label 8 and cut that label shape into pieces just the right size for the card. The image was stamped with Memento Paris Dusk and clear embossed. Now that I look at it, I could have done a better job lining up the image with the cutting die - oh well - it's hand-made after all. Another navy piece was cut with the same sized die and added, just off-set a bit, to the back of image for stability. MFT rolled roses and Spellbinders for Heartfelt Creations Decorative Chateau Gate vines and leaves were added to the panel. A few dots of trusty Liquid Pearls filled in the empty corners. Here's a shot of the card when it's open. Oh, this shot reminds me...I also stamped a second image, trimmed around the butterfly shape, colored it with Copics, folded it in half, and glued just the centre line to the image. I've always avoided the kraft-colored sheets in my paper assortments. They look like old grocery bags to me (yes, I realize I am dating myself). But one of the challenges in the Splitcoast Love Fest is a Color Challenge using pink, red, kraft and white. I created something with kraft-colored ink, as you can see below, but something kept telling me to pull out a sheet of craft and give it a go. The result was pleasantly surprizing. I used a dark red SU card base, and just one top layer in SU kraft. It was heat embossed with VersaMark and white powder. Then I used SU water color crayons to add layers of color to the flower. Finally I sponged around the edges with Distress Ink Aged Mahogany. 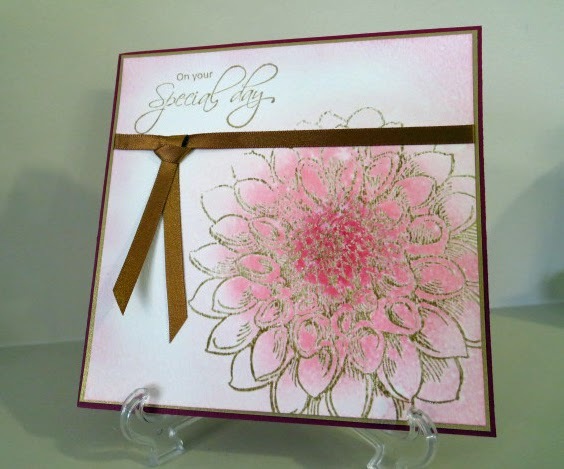 Stamps used here are Stampendous Jumbo Dahlia and Heartfelt Creations Classic Messages. A little ribbon and a few Liquid Pearl dots finished it up, Quite a simple card, and goes together quickly. This one was stamped on watercolor paper with Memento Toffee Crunch, heat embossed in clear, and colored with Distress Inks Aged Mahogany, Worn Lipstick and Spun Sugar. The same card was used for the base, but a layer of thin gold metallic paper was added behind the focal image. Very quick and simple. As a result of a previous Splitcoast Challenge, I was fortunate enough to win a prize from The Cat's Pajamas. What a thrill! I chose their Home Tweet Home stamp set and also picked up the matching die. 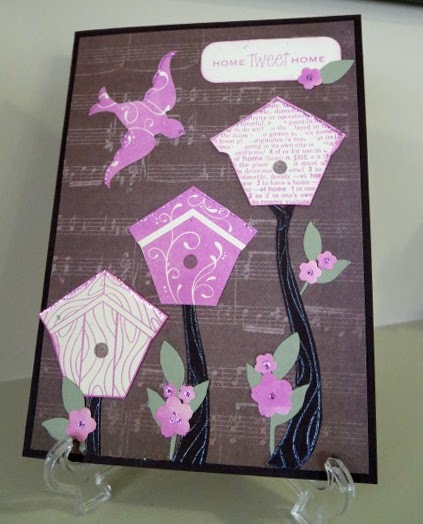 I've used both here today in this challenge inspired by the pictures in their Inspiration Challenge which just happened to feature birdhouses and an iron gate (Hero Arts Metal Flourish). One of my favorite techniques is sponging Distress Ink onto watercolor paper. Sometimes I spritz the paper with water after; sometimes not. The inks used here are Scattered Straw, Shabby Shutters, Broken China and Pumice Stone. 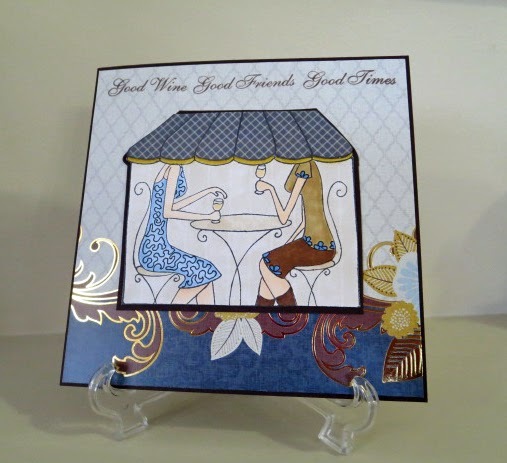 VersaMark ink and Stampendous Pearlustre Sapphire embossing powder were used on the images and greeting. Spellbinders Fancy Tag 3 cradles the sentiment. Besides watercolor paper, I used Petallics as a base, and navy SU card. This stamp set comes with so many sweet bird houses. Below is another project featuring them all. Still with the Splitcoast Stampers Love Fest set of challenges; this one hosted by My Favorite Things and the theme is heartfelt greetings. This little lady is MFT Sweet Spring Joline. She's another image I've had for a while, but my favorite images never seem to lose their appeal. This card has a 5 3/4 " square base cut from Stamping Up card. The patterned paper is from DCWV Lace and Linen Stack. Brown Memento ink was stamped on X-Press It Blending Card. The image was cut with a Spellbinders Labels 4 die, and the scallops where the two papers is a die from MFT. Distress Ink in Antique Linen and Worn Lipstick was sponged when the paper was still in the label die. I maybe should have used a die one size larger, but I didn't want to cover up any more of the pretty paper than was necessary. There's only one trick on this card. After coloring the dress with Copics, I allowed it to dry, then saturated a scrap of lace with Copic Colorless Blender. I then held it over the dress for a couple of seconds and allowed that to dry before coloring the rest of the image. This my second post of the day, all in an effort to post before the end of Splitcoast Stampers Love Fest challenge - lol. The challenge here, hosted by Stamping Bella, is to create a project based on thinking about Spring. When I think Spring, I think of shopping with my mom for new shoes and an Easter outfit - so exciting! Any Bella worth her salt would be taken in by this dress in a store window. This focal image is a new concept for me. It's a "topper" from a CD of art produced by Jem's Designs. You simply slip the disc into your computer, choose an image and print it in glorious color - how cool is that? I learned about this potential on the blog of my friend Crafting Vicky. Thanks, Vicky. So, what does a girl do with a simply gorgeous image? You want to frame it, but not overwhelm it, right? Seriously, it took way longer to design the card and choose the best paper, than it would have taken to color six images, but I just loved the result. Bella cardstock in chocolate forms the base. Gold from the DCWV Shimmer Stack serves as the background and pink glitter from the DCWV Chateau Lavender cardstock stack adds just a touch of glamor. Die cuts used here are Marianne LR0202 and Spellbinders Cherry Blossoms. Now, I just wish I had somewhere to go to wear a dress like this. Oh, and a strapless bra...nevermind...it's too cold here anyway. I should take a hint from The Boss and just curl up into a cat ball in a corner of the couch. Don't these ladies remind you of good times with your good friends? To borrow a saying from another stamp set, "My girlfriends bless my life". I guess that's why I relate to this image from My Favorite Things called "Meet Me at the Café". Here's another project for the Splitcoast Stampers Love Fest set of challenges. The focus of this challenge is to doodle on your image. A Copic Multiliner #0.2 was used to create the lace on the blue dress and the flowers on the brown outfit. I also used a Copic Colorless Blender to add stripes to the background, but you'll really have to squint to pick them out in this photo. Bella chocolate cardstock forms the base of the card. The patterned papers come from the DCWV Linen Stack. And, as usual, X-Press It Blending Card was used to stamp my image with Memento Black, and Cocoa was used for the sentiment. Copic colors are....oops - forgot to note them this time. Pick your favorite blue, 2 browns, 2 taupes and a gold. I'll probably be back again later today as I have many projects to post for the Love Fest challenge before the deadline. I hope you're playing along, too. At Splitcoast Stampers, you'll find an eleven part challenge going on called Love Fest. The challenge I'm posting about today asks us to consider the Joys, Benefits and Challenges of Crafting OCD. That made me smile - it's as if the challenge creators could see inside my head! I'm all about the organization of my crafting space. In fact, I can't create if things are messy or unorganized or, especially, if things don't go the way I think they should. For that reason, I've set up a few systems in my craft room that facilitate the smooth flow of inspiration. Copic coloring and blending was something that I first found frustrating cause I didn't know exactly what to expect when I used a certain marker. Many projects were scrapped or changed on the spot because I grabbed the wrong marker. To keep my mood sunny and productive, I needed to be able to put my hands on exactly the right color - right now! To save hours of frustration and waste, I grudgingly took the time to set up a little book which features a small image colored with every marker I have, shaded with a marker one to three steps up. (Since then, I've learned about the 10+2 shading rule, so new pages will have to be added, but that's another day.) If you look close at the coloring, you might cringe - the book was created in my early days with Copics and the coloring is a bit rough. Still, the book makes it super easy to match paper, ribbon, etc. An unexpected bonus was that it gave me the opportunity to really become familiar with the markers in my collection. I've also put together pages of skin tones and hair coloring choices using images and color combos offered in book 3 of the Copic Coloring Guide (see below) Since I refer to these each and every time I color a person, the time it took to prepare the pages was really worthwhile. I'm so glad I took the time to prepare this little book, and hope you give these ideas a try. I've recently began to rip out pages from glossy magazines which feature people with differing ethnicities, and my next goal is to match those hair and skin colors with Copic colors - wish me luck cause I'm gonna need it! 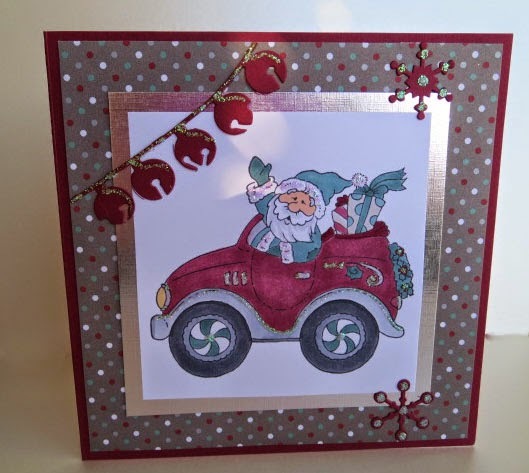 I love playing along with Splitcoast Stampers challenges because they really stir the creative juices. The current challenge, Love Fest, salutes the member companies whose support is so vital to the site, but it also connects paper artists who unfailingly cheer each other on toward refining their skills. It's not too late to participate in Love Fest - scoot on over and get inspired. This project is for the first of the challenges, Puppy Love, which features critters. I appreciate animals, especially sweet little dogs, but I'm a cat person at heart so I naturally gravitate to feline images. This one is so cute and so much fun to color. This is Penny Black's Tulip Jungle, along with Hero Arts' Friendship. After coloring and trimming the image, I laid it on my measuring mat and added my clear stamp to see if I could cut a mat large enough to accommodate the design I had in mind, yet small enough to fit the card base. Woo hoo - just enough room for the sentiment I wanted to use and a narrow ribbon. I cut the base, heat embossed the sentiment and rounded the corners. Then I went to my ribbon and - what do you know - nothing suitable! Why is it that no matter the size of your stash, you don't have exactly what you need for a certain project? Reminds me of buying my last purse at Sears - a whole wall of purses, but nothing exactly like I wanted. What to do? I grabbed on to a scrap of the purple paper and cut a small scalloped border - design saved. Dots of Liquid Pearls finished it off. Here's a shot of The Boss - my real life kitty inspiration. As you can see, she knows how to relax! And she knows she's only supposed to sit where her blankie is, not on the couch fabric - that's a cat for ya. It's been a while since I've posted a new project, but I'm back. My father has experienced a challenging health issue over the past few months and, seeing as I'm the only kid in town, I'm the "go to" caregiver. Dad's doing better these days and it's time to get back to the things in my craft room that feed my soul. Impression Obsession's current challenge is to create a birthday project. I've chosen their Balloon image for my card. I think it's great for a birthday card, but it could suit any celebration. I must credit my friend Barbie for this color choice. Barbie and I were crafting the other day, and she put these colors together - so pretty. Other products include pop dots, Stickles and Liquid Pearls. This project also features Impression Obsession stamps, but I don't think it qualifies for the contest as I've used another company's die in my design. The stamps are Letters Mingle Souls and Mini Messages. The die is Spellbinders for Heartfelt Creations Decorative Lace Border. Stampin Up was used for the base, the same Prima paper as above for the lace, and some DCWV for the solid color paper on which I heat embossed the image using Memento Rich Cocoa. I stamped the pen first, then covered it up with a scrap of the same image, and then stamped the envelope. I mounted the image on a scrap of American Crafts brown paper, trimmed around and mounted with pop dots. The image paper looks a little pinker here than it does in real. The doodle in the corner was done with various stencils and Liquid Pearls. I hope you get some inspiration from todays post. It's good to be back in the groove! Paper piecing is a great way to add pattern and color detail to your images. Check out all the image lines and polka dots on the dress in the project above - I don't know about you, but I could never do that freehand. 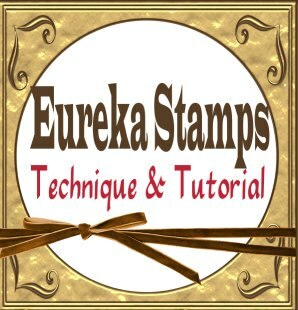 This project features a digital image from Eureka Stamps . Off the top, I have to apologize for the slant on the photo - new camera that I'm still getting used to. This will be my last project for the Eureka/QKR Techniques and Tutorial Team. It's been a year since Maribeth accepted my application to join the team - my first design team ever! - and it's been a great experience. I have learned so much in that time. Special thanks are sent to Maribeth for her amazing support of the design team. My appreciation also goes out to Jackie, DT Leader, for her encouragement and support. Thanks also to Tina (DT Admin go-to-expert) for all her efforts, Ruza (fellow team member and a woman who has it ALL together) for all the technical expertise as I learned the ropes of being a DT member. Special thanks also to Joann Burton aka Sassy Raggedy (my original T&T Team partner) for her amazing inspiration and friendship. Ladies of the QKR and Eureka DT Teams - you rock! And on to how to actually paper piece with digital images. First, print your image on the card you prefer for coloring, in a size that suits your project. My go-to paper for Copic coloring is X-Press It Blending card. From there, you have two options. The first option is to print your image again, in the same size, on a blank piece of inexpensive card. Then tape a piece of patterned paper over the printed image ensuring that the paper, but no tape, covers the part of the image you want in the pattern (i.e. her dress). Run the whole package through the printer again. The second option is to cut a piece of patterned paper in a size that will fit your printer, and print the image again. Whichever of the two options you chose, now comes the tricky part - carefully cutting the part you want from the image. I try to cut right on the line, so I can line my piece up with the printed image. But it might be smarter to cut just outside the line and thus cover up the line on the image. Now color the base image with Copics or whatever medium you prefer. At this point, I cut out my base image because I wanted her to pop off the page with pop dots. However, you could shape the image with any die cut frame. Now spread glue on the back of your patterned pieces and adhere them to the image. Get as creative as you wish. Perhaps you could print the image on a second patterned paper and have her sash in a different color? I used a bit of grey to shade the folds of the dress, and some blue where the underside of the fabric shows, and colored her petticoat layers in different shades. 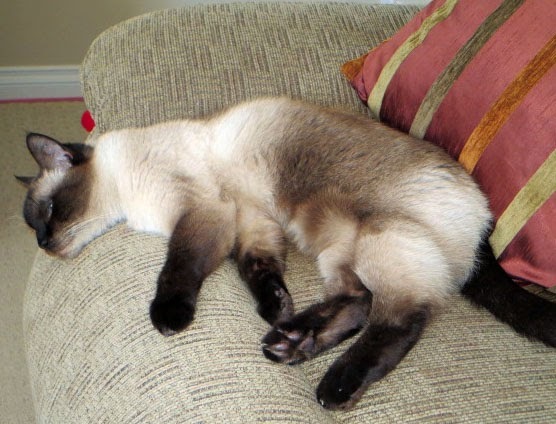 Here's a shot of The Boss re-charging her batteries after a long afternoon of supervising in the craft room. 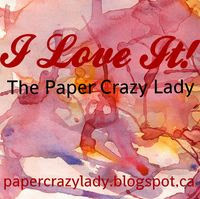 Too see all my designs, check out my Gallery at Splitcoast Stampers. I'm a member of the Team! Click on the car and visit the blog. Creativity seems to be something that was handed down to me through my genes. My grandmother was a pastry chef, my aunt is a painter, my father is a woodworker. My mother taught me to knit. When I can share this passion and pass it on to others, I'm at my happiest. To craft or not to craft - I don't understand the question! Art is an important part of my life. Quite simply, it makes me feel good and so I devote a lot of time to taking raw materials and turning them into something I think is quite special. Paper art is my current passion, although I enjoy many other crafts such as sewing, knitting, decorative painting and making jewellery. I've been reading and admiring other artists' blogs for a while now. I learn from other artists, and I hope anyone looking at my work will take away some new ideas, too. Creating, whatever the medium, is worth the time and effort. If you are just starting to craft, don't be too hard on yourself. Anything worthwhile takes time to achieve. Just make a start, keep an open mind, evolve and, most of all, enjoy the process.